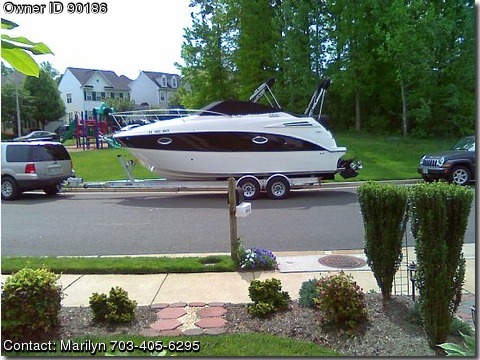 This is a 2007 Maxum 2400 SE bought new in 2008 with 2008 Venture tandem axle trailer. Boat has been dry stored and use in fresh water only. The Engine is a 350 Mag 300 hp with a Bravo III out drive which is the most power this boat comes with. Cruises at about 30 mph and a top speed of 46 mph. Engine has ONLY 56 hours of use. Enter the transom platform through the glass gate. Transom has a telescoping ladder and fresh water shower that extends from the wet bar with sink, cutting board and designated cooler storage. Seating in cockpit area known as "Active Seating" the back seat has 3 positions to convert all seats from portside to aft into one big lounge area or flip the seat down to enjoy transom area or flip it up for dinning at the table. At the helm the captians seat allows room for 2 with a bolster cushion and swivels around to join the party when at your destination. The dash has full anolog gauges and has computerized "Smart Gauges" that tell you exactly everything you need to know, just like some cars have today. Also has tilt steering wheel, compass, and remote spot light. There is an am/fm, 6 disc CD, satelite ready, and MP3 JBL sound system with 2 6"x9" speakers aft 2- 6" mid ship and 2-6" down below with remotes at helm and aft. Cockpit has snap in Burber carpet for easy cleaning and comes with complete camper canvas packge. As you head down into the cabin the forward dining area there is a wood grain table that drops down to convert into the forward berth thats sleeps 2 adults. theres also a newly upgraded 22" flat screen tv thats hooked to the dvd player and has cable ready connection at the port side of boat. There is a mid ship queen size bed which also sleeps 2 adults. At the galley there is a microwave, electric stove top, sink, fridge, and cabinet storage to accommdate your cooking needs. Also included, a stainless grill that mounts on bow rail and is portible for grilling on shore. Through the wood grain door on the starboard side is the bath room with vanity, sink, toilet, and shower. Cabin has heat/ac, hot water heater, lights throughout, and electrical outlets. The boat has only been used 3 seasons and has been maintained with top products offered by the dealer. Comes with just about everything you need to spend that weekend away. You just need to add the water!